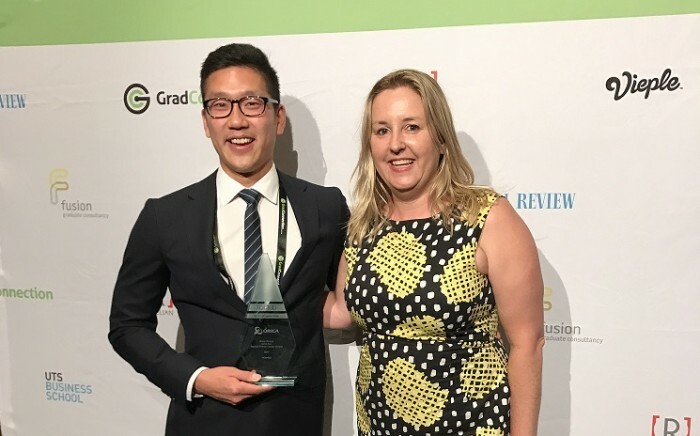 Curtin University came out in force at the recent GradConnection Top 100 Future Leaders Awards, with five finalists nominated – and one of those finalists winning their category. Michael Song, Troy Burgess, Danika Wellington and Bodhi Hardinge all flew over to Sydney to compete in the event, with Michael Song from our Faculty of Science and Engineering taking out the top prize in the Orica Mining, Oil & Gas Award. David Castelanelli was also a finalist but was unable to attend the event. All students had to complete a rigorous graduate application process, including an online assessment and interview, assessment centre and presentation to reach the finals. After being through a mock recruitment process that a lot of students will go through when applying for graduate positions, my advice is to take advantage of the services that you have at university, including Careers, Employment & Leadership. I’ve been coming to see a Career Development Consultant for two to three years now, going through revisions of my CV, practicing interview skills, learning about assessment centres. It’s also really important to network with industry while you are at university. I joined NEXT STEP: Industry Mentoring and was paired with a mentor that gave me great insight into the day to day life of working in the resources industry. Finally, although your grades are important, employers are looking for candidates with leadership qualities, the ability to work in a team and great communication skills so make sure you spend your time at university practicing those skills as well. By participating in the GradConnection Top 100 Future Leaders Awards, I learnt a lot of professional identity and personal brand. You can’t just put your best foot forward; you have to put your whole self forward. What I mean by this is that you can’t just appear to be a leader, you have to be a leader. When you really do practice what you preach it comes across and it’s a good impression to make. If you are uncomfortable about public speaking, leadership, or just generally networking, go out of your way to practice, practice, practice. Just like in a professional environment, this competition focused heavily on your personal brand. Many people may not be familiar with the term or actively worked on developing it, but the fact is everyone already has one. My advice is take control of your personal brand. People are always going to judge you based on your actions and behaviours but you can shape your personal brand to how you wish to be perceived and known by others. Opportunities like this competition provide you with a platform where you can use your strong public speaking skills and leadership qualities to express what’s important to you as a person. I enjoy advocating the importance of Science, Technology, Engineering and Mathematics (STEM) with the wider community and the Top 100 Future Leaders competition only serves to strengthen how my personal brand reflects this. Graduates nowadays can’t just have great academic results. Well-rounded candidates that get out into the community, have great communication skills and have experience in the workplace are the ones getting the best jobs. The best part of Top 100 Future Leaders Awards were the connections I made. I was inspired by what other young people have achieved and helped me to better shape my own goals and ambitions. Everyone was so friendly and I love now having a network of passionate, driven young people from all over Australia that I can draw upon. I would encourage other grads to look for every opportunity, even if it seems out of reach. You can’t sit back and wait for them to land in your lap because you’ll miss the boat. It can be scary, but taking a few risks can pay off in the long run.